Advances in technology and the spread of the internet has made it easier than ever for animators to share their work with the masses. But with ease of sharing, comes the challenge of finding the right audience. A challenge made all the more difficult by the growing sea of information. How do you know what's worth watching? That's where we come in! 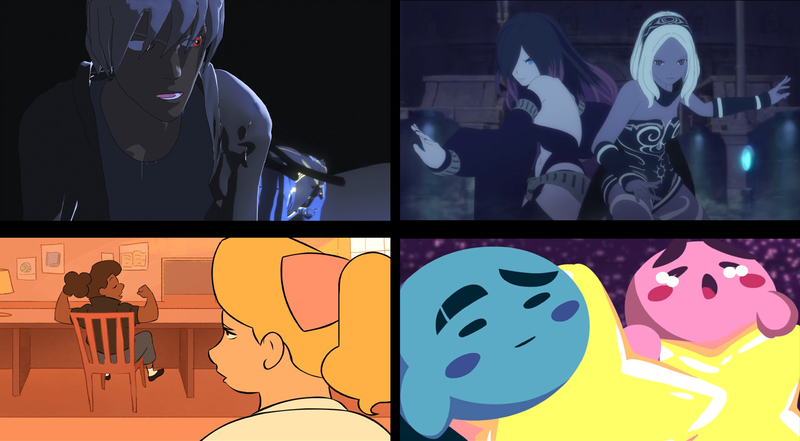 Welcome to this month's edition of one of AFA's favorite segments...Web Animation Watch. If you've made something that would be a good fit for a future installment, drop us a line and let us know! Deadstar is an ongoing 3D sci-fi/fantasy series written/animated/directed by Brandon Wright. The story focuses around the respective journeys of Harrison and Panala. Harrison, a red-eyed mercenary, who has been hired to battle a powerful drug cartel in order to help complete important research project started by his late mother. Panala, a young girl with seafoam hair, is the eighth clone of a terminally ill princess of a faraway world. When Panala begins to assert her own individuality, she decides to escape into an uncertain galaxy. In order to decide for herself what kind of person she wants to be. After a chance meeting with Harrison, the two reluctantly begin to travel together. On a journey that may very well tied to the fate of the galaxy itself. This short in particular follows Harrison (prior to the series start) as he has an unusual encounter while on a job. Deadstar has been a labor of love for Brandon Wright since 2011. He began animating the series not long after enrolling at The Art Institute of Philadelphia as an Animation Major. Despite his lack of experience with animation/film making at the time of creation, Brandon persevered and has continued to create episodes through the use of Blender Animation. The art design of Deadstar takes quite a few ques from Japanese animation (in both action and humor) due to Brandon's passion for the expressive style. The series currently stands at two seasons with 9, 10 - 13 minute, episodes and one feature film, "Memories in the Rain" (featuring the voice talents of anime veterans Yuri Lowenthal and Johnny Young Bosch). Though the animation can be rough around the edges, there is no denying the dedication that went into bringing this story and its characters to life. From elaborate locales, to interesting character dynamics, Deadstar is a mind-bending sci/fi epic with a lot of potential. Not long before the release of Gravity Rush 2, Sony Interactive Entertainment released this animated short in order to promote the title's release. Gravity Rush Overture (animated by Studio Khara) bridges the gap in the narrative between the first and second games, illustrating the event that would take Kat and her companions far from their peaceful life in Hekseville, thrusting them headlong into another adventure. What makes this short unique is how the animation is presented. While 3D model characters that try to mimic the 2D anime style can be a bit hit or miss with certain viewers, Gravity Rush manages to find a perfect marriage between the two styles. Given the fact that the games themselves display both polished cel shaded animation and 2D comic cutscenes, this particular style seems to be the perfect fit. Overture may not explain a whole lot in terms of the story itself, but it is still a nice taste test for those who haven't played the games to experience the series charming characters. Based on the ongoing web comic by Chelsey Furedi, Rock and Riot tells the story of two teenage gangs in the 1950s with a bit of a LGBTQ twist. The animated pilot (animated by the comic creator herself) is an adaptation of the first episode of the comic, which follows the initial meeting of characters Connie and Carla. While the 1950's setting and character designs are already delightful, the animation brings a lot of great energy to the narrative which flows smoothly from one scene to the next. Like any classic cartoon, Rock and Riot has humor, heart and a whole lot of style. Game Grumps Animated - Everybody Wins! If you're someone who likes to follow video game Let's Plays, chances are you've probably at least heard of the Game Grumps. A group of friends who go out of their way to play both the best and the worst that video games have to offer (complete with over the top reaction and rage quits). Love them or hate them, the Game Grumps antics have attracted a lot of attention from the video game community, including quite a few animators. So extensive is their animator fan base that there is a Youtube channel dedicated to short animations set to the Let's Plays audio. This short in particular, animated by Dalton Brown (aka SmashToons), depicts the Game Grumps play VS mode on Kirby's Dream Course. What really endeared me to this short is not only the soft color pallet but the attention to detail on the character acting. The voices may be the Grumps, but the moments are distinctly Kirby. A detail that adds another layer of humor to the already amusing scenario.